The Strip's health ministry reported over 250 Palestinians killed - protesting peacefully for fundamental rights denied them by the Netanyahu regime. Israeli troops were ordered to use live fire, toxic tear gas, and other harshness against demonstrators threatening no one. The horrific toll will increase exponentially as long as protests continue - including when held in the West Bank and East Jerusalem. It's part of their training, along with showing muscular superiority over people they're taught to hate, brutalizing them because who'll intervene to stop them. Who'll protect an entire population of unwanted people, victims of Ziofascist extremism. It's why incidents like the killing of two soldiers and wounding others happened last weekend. If one or more Palestinians were responsible, it's payback for decades of occupation harshness. It's outrage and frustration over intolerable conditions, the world community doing nothing to protect the lives, rights and welfare of millions of persecuted Palestinians. B'Tselem commented on Israel's free-fire policy against them, notably during Great March of Return protests in Gaza. Virtually no one killed or injured threatened soldiers or Jewish civilians. Israeli claims otherwise were and remain bald-faced Big Lies. Illegal blockade of the Strip since mid-2007 devastated Gaza's health system, its access to drugs, medical equipment, and spare parts greatly restricted. Last April, the Adalah and Al-Mezan human rights group "petitioned Israel's High Court of Justice on behalf of two wounded men, since amputation would be likely with the care available in Gaza." Netanyahu regime lawyers told the court their request was denied, "given the policy of the Minister of Defense on the issue, whereby, as a rule, entry into Israel shall not be granted to persons injured while taking part in the violent public disturbances organized by Hamas (sic), where the concrete medical circumstances were not deemed to warrant considering a departure from said rule, as the petitioners are not in a life-threatening condition." 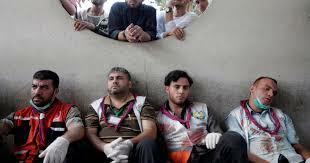 Gazas were warned "against participating in the demonstrations," their legitimate right under international law. According to the Netanyahu regime, exercising it justifies denying them access to adequate medical treatment when urgently needed. They declined to rule on Israel's illegal blockade, imposed for political reasons, unrelated to security. Requests made don't reflect numbers of injured Palestinians needing treatment unavailable in the Strip - because it's well known that permission most often is denied or ignored. Israel "instituted an open-fire policy that allows live gunfire at protestors posing no danger, resulting in thousands of injuries – a policy it still refuses to change, a year in, although the horrific outcome has been commonly known for some time." Israel's illegal blockade caused Gaza's healthcare system to collapse when it comes to treating serious illnesses and injuries. "Since the protests began east of Khan Yunis, I volunteered with the Red Crescent to give first aid. During the demonstration, I was hit by a live bullet in the right leg, even though I was far from the fence. I was taken to the European Hospital and stayed there three days." While I was still in hospital, the doctors referred me for further treatment to al-Makassed Hospital in East Jerusalem. I have to undergo another complicated procedure that can't be performed in Gaza. I filled out the Palestinian Health Ministry's form and scheduled an appointment at al-Mkassed for 12 November 2018. The day before, I got a text message saying my request was still under review. I couldn't make the appointment and scheduled another one for 10 December 2018. Then my request was rejected. The third time, I set an appointment for 7 January 2019 and was rejected again. I have another appointment scheduled for 5 March and have filed a fourth request. I am now waiting for a reply, again. Meanwhile, I've also filed a request for treatment in Egypt, in case I can't get to East Jerusalem, because my leg is in bad shape. There are complications from infections in the bone. It's a dangerous condition and if I don't get proper treatment, they may have to amputate. In the meantime, I'm having physiotherapy sessions with Doctors Without Borders. I go to their clinic every two days. They also provide transport to and from the clinic, because I can't drive my car. I use crutches and only leave home to go for treatment. It's easier to go to hospital and treatments from there. Sometimes I spend one day a week at home, with my wife and kids. I'm stressed all the time and it's had a bad effect on my relationships with my family. Since the injury, I also haven't worked. I used to run projects for NGOs, but my career is over. I spend most of my time on social media and undergoing treatments." 'Issawi's ordeal reflects the suffering of countless thousands of other Gazans - victims of Israeli ruthlessness the world community forgot. B'Tselem published other testimonies. Suffocating under endless blockade, virtually every Gazan family has horror stories to tell - the world community turning a blind eye and deaf ear to their suffering.